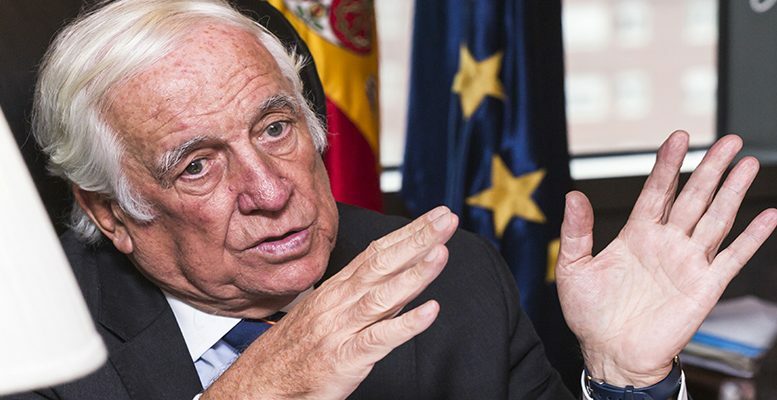 "Spain is not just an exporting country, but an investor abroad"
Ana Fuentes/Carlos Díaz Güell | Carlos Espinosa de los Monteros is High Commissioner for the Spain Brand (Marca España). He is a privileged observer of the economic reality in Spain and how its business class has evolved over the last few decades. Firstly, from the public sector, then from the private sector, and now from government. Increasingly more cautious and circumspect, for him its clear that in a global market, companies and the government either have a brand or they don’t exist. Q: To what extent is the situation in Catalonia affecting the Spain brand? A: That’s not an easy question. There is a structural component in a country’s brand which moves very slowly and a conjunctural one which depends on what is happening in the short-term. No-one knows how long the situation in Catalonia is going to last. If everything went back to normal tomorrow, I would say that what is known as the “procés” would have a small impact on Catalonia and a very much reduced effect on the rest of Spain. But if this gets entrenched and continues, then yes, the impact would be much more significant. No-one has taken an important decision. Neither in the case of Spain nor Catalonia. No major investment which was on the cards has been cancelled; there have been a few small substitutions in Spain in terms of tourism, for example, but not an important decline. In any event, we are very conscious of what happened with the German businessmen in Barcelona. We would be stupid to ignore this reaction. A: The relationship between brands and their country of origin is two-way: the country brand benefits from the presence or success of successive corporate brands, which in turn benefit from the country brand if it’s a good one. In some cases there is probably an imbalance. The Inditex or Zara brand help the Spain Brand more than the other way round, but we are talking about one of the 8 or 10 top companies in the world. But in Spain’s case in particular, there is a much wider range which do enter the game: I help you…you help me. Spain is a country which has not had much presence overseas in the areas of industry and commerce up until a few decades ago, for many different reasons. These include isolation, arriving late for the industrial revolution and a whole series of topics. Today, in some markets, when ordinary people talk about Spain it’s about Real Madrid or FC Barcelona. However in other places, our image as a country is good and very strong. Q: Does the fact there is a reduced number of famous brands make it difficult to create a Spain Brand? A: A lot of clarification is required here because the brands which the public know normally belong to consumer goods. But others, like industrial, leading biochemical or construction brands, are not known by the public at large. We could cite many examples, like that of a Spanish firm which is a global leader in public construction works, but most people are not familiar with its brand. Nevertheless it enjoys huge prestige at a global level, so it will lead consortia and win tenders, because it has built up a renowned brand in its sector. A lot of times we simplify too much and think that the country brand is linked to consumer goods, but that is not the case. It is made up of an endless number of realities. Spain has a good number of firms which, although they are not known to the public at large since they are not linked to the sun, good food, sports or culture, still enjoy great international prestige and are global leaders, creating the Spain Brand. A: What ambassadors want, and that’s their job, is that every time there is an idea of what to do in their destination, there is a Spanish company to sponsor it. And here I insist: we need to remember where we come from and who we are. We were a very poor country which in the last 40 years has made a spectacular transformation. Today there are over 150,000 companies which export regularly and have exported at least in the last three years. And now we are not talking about manufacturing companies, or those which produce bulk goods. Rather companies which in countries like India have more than five factories. Spain is not just an exporting country, but also one which invests abroad. One thing is that they buy your merchandise abroad and another that you install your factories in other countries. This is something which Spain is doing on an increasing basis. Q: What five sectors do you think best project and support the image of the Spain Brand? A: Leaving aside culture and sport, we could mention the hotel sector, which is well regarded across the globe. The food sector in general, particularly in Europe, which reflects the Spain Brand very well. Also the construction sector, which carries out the most important, most complex and the biggest projects in the world, like the Mecca-Medina train. This is the top project in the railway industry in terms of its financial value, its technological challenge and because it has managed to create a train which runs at 350 km/hour through the desert…The fashion sector, including footwear and accessories. And lastly, the renewable energy sector. Not necessarily in the order I have mentioned them, but these five sectors are where Spain has the most prestigious international presence.